Putting Learner Success First: A Shared Vision for the Future of CTE lays out a reality where all learners have access to a high-quality education that leads to rewarding career opportunities and can gain the skills they need, when they them, without the limitations of place or time. Yet in too many states, learners in rural communities are less likely to have access to Career Technical Education (CTE) pathways, experiences and supports than their peers in suburban or urban areas. Given the unique challenges to expanding CTE on the “frontier,” Advance CTE launched a year-long initiative to unpack the biggest barriers and identify promising practices from across the country. 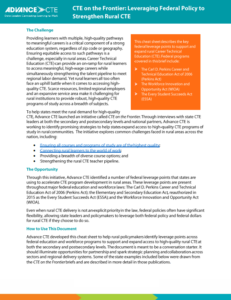 Based on interviews with over a dozen state secondary and postsecondary leaders – in addition to local practitioners and national experts – Advance CTE released a series of four briefs with short case studies on states’ approaches to addressing the most pressing challenges to expanding access to high-quality CTE pathways in rural communities. 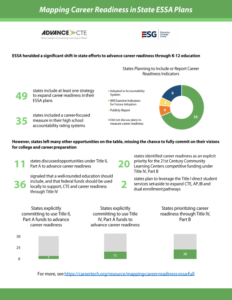 While this research and the embedded case studies can serve as a critical resource for states as they advance their own priorities and policies to address gaps in rural CTE pathways and experiences, it also shined a light on how interwoven each of these challenges are and the need for states to address all of them comprehensively and collaboratively. 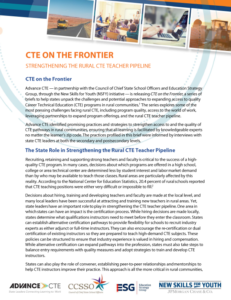 To support such efforts, Advance CTE has released its CTE on the Frontier: Rural CTE Strategy Guide. 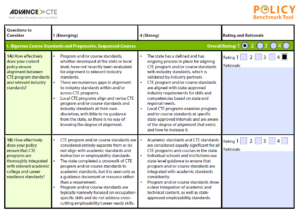 This tool offers series of questions for state leaders to use as they reflect on current efforts to expand access to high-quality CTE and career-focused pathways and experiences in rural communities and to identify future opportunities and actions. While many of the questions may be difficult to answer at this time, those unanswerable questions can provide a lot of direction for a state’s next steps, including data to gather and partners to engage. Want to learn more? Join us for a webinar on the CTE on the Frontier research and lessons learned on May 17. Register today! Strengthening the rural CTE teacher pipeline (ft. Kentucky, Louisiana, Missouri, Mississippi and Hawaii). CTE on the Frontier was developed through the New Skills for Youth initiative, a partnership of the Council of Chief State School Officers, Advance CTE and Education Strategy Group, generously funded by JPMorgan Chase & Co.
Today, Advance CTE and the American School Counselor Association (ASCA) released a report exploring the strategies currently in place across the country to support career advising and development efforts. Too often, career advising and development only occurs at the high school level, even though learners should have access to career awareness, exploration and planning activities from elementary school all the way through postsecondary education. Anecdotally, many state and local leaders assume that this is not happening to the extent that it should be, but there has not yet been an in-depth examination of the data. 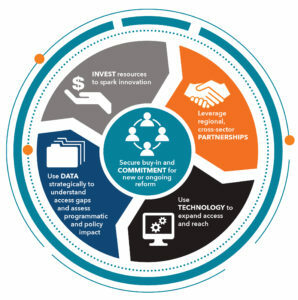 This topic has been a key focus of the New Skills for Youth (NSFY) initiative, a partnership of the Council of Chief State School Officers, Advance CTE and Education Strategy Group, generously funded by JPMorgan Chase & Co. NSFY has provided funding to 10 states to transform their career readiness systems, and all 10 participating states have strategies in place to improve their career advising and development activities. 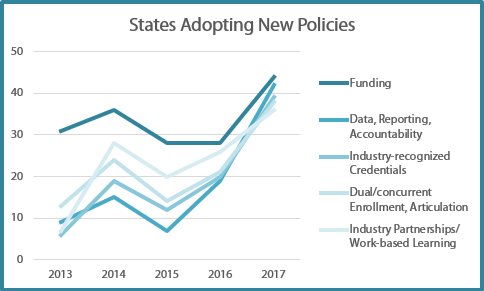 Across the board, states are not overly confident in the effectiveness of their career advising and development systems. 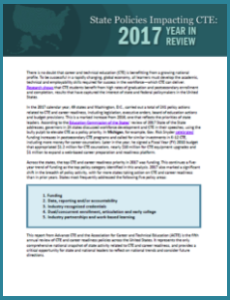 Fifty-eight percent believe they are only somewhat effectively serving K-12 students, and 55 percent believe they are either only somewhat effective or not effective at serving postsecondary CTE students. 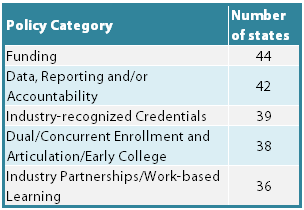 States, on average, are supporting a multitude of strategies at the K-12 level for career advising and development (an average of 5.7 strategies), yet they report mixed levels of effectiveness for both the individual strategies and collectively. Similarly, school counselors also employ many strategies (an average of 5.8) in their career advising and development work and generally feel more optimistic about the effectiveness of their strategies than states do about state-level strategies. Sixty percent of high school counselors use connecting students with CTE coursework and career pathways as a career advising and development strategy, and 91 percent of those find it effective or extremely effective, with a full 50 percent labeling it extremely effective. School counselors struggle with balancing their heavy workloads and other counseling responsibilities, and they want more professional development and community conversations around career readiness to support their students more effectively. The report examined numerous strategies currently in place to support career advising and development efforts. Wisconsin’s Academic and Career Plan, for example, is an ongoing process for middle and high school students that involves coordinated conversations around career interests and options, and that helps students make informed choices about career pathways. Texas has spent the last few years developing extensive virtual supports for school counselors, available through TXCTE.org and Texas OnCourse. These resources provide school counselors with messaging materials, lesson plans and other information on CTE and career advising. Maryland has leveraged state and organizational partnerships to develop several career advising strategies at the elementary and middle school levels, which incorporate career awareness and exposure with civic engagement and financial literacy. To hear more about this report, join our webinar on February 20, which will feature presentations from ASCA and Advance CTE, as well as a local CTE practitioner.